Vice President Mohammad Hamid Ansari on Thursday said his just-concluded visits to Hungary and Algeria were aimed at reconnecting India's old ties with the two countries.During his visit, he had a wide range of discussions with the respective leadership in the two nations.Speaking to reporters onboard Air India One Special Aircraft on his way back to New Delhi after a five-day visit to Hungary and Algeria, Ansari said there was agreement on taking the India-Algeria ties to a new level and how to rejuvenate the bilateral relations. 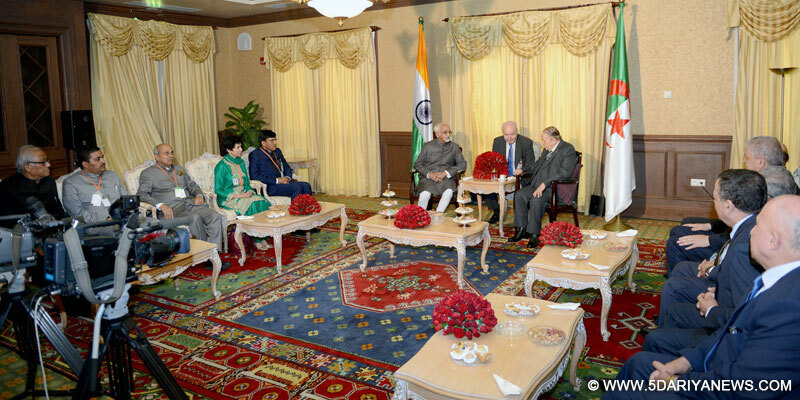 According to a release here, the Vice President said that Algeria was willing to cooperate with India in several sectors including energy, security, space and fertilisers. "There was willingness on both sides on the possibility of setting up of a joint venture fertilisers plant by Algeria and India in the north African country," the release quoted Ansari as saying. Talking about Hungary, he said there were substantive discussions with the Hungarian leadership on various issues. Hungary agreed with India on elimination of the menace of terrorism and supported a strong global legal framework and sustained global action to deal with the threat, he pointed out. Two Memorandums of Understanding (MoUs) were also signed with Hungary -- one on water management and the other by Indian Council of World Affairs, Ansari told mediapersons.The two nations also agreed upon setting up a working group on science and technology to explore the possibilities of bilateral cooperation in various issues, including defence technologies for mutual benefits, he added.